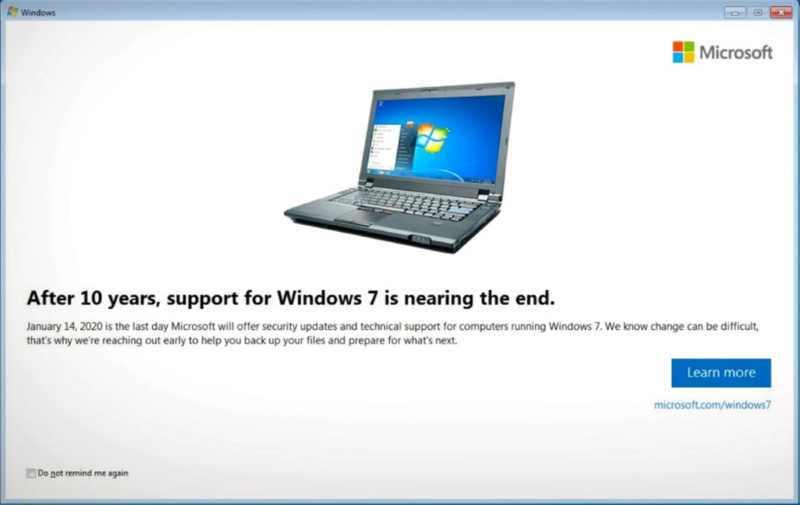 Windows 7 users getting a popup to remind them of the end of support | just another windows noob ? Windows 7 users will begin seeing the following popup (as of 2019/3/19) to remind them of the imminent demise (in terms of security updates) of the operating system. This is what Microsoft said about the popup. …if you are a Windows 7 customer, you can expect to see a notification appear on your Windows 7 PC. This is a courtesy reminder that you can expect to see a handful of times in 2019. By starting the reminders now, our hope is that you have time to plan and prepare for this transition. These notifications are designed to help provide information only and if you would prefer not to receive them again, you’ll be able to select an option for “do not notify me again,” and we will not send you any further reminders. The end of extended support for Windows 7 is explained here and you need to note that this applies to Windows 7 Service Pack 1. Support for Windows 7 RTM without service packs already ended on April 9, 2013. So if you absolutely have to keep running Windows 7 until the end of the year, then be sure to install Windows 7 Service Pack 1 to continue to receive support and updates. The obvious solution is to upgrade to Windows 10, and you can use the following method to do so. It requires PowerShell and good SCCM (System Center Configuration Manager) knowledge but if you follow the detailed guide you’ll be OK. The following links should help you migrate away from Windows 7.